Why are bed bugs back in the news? Once bed bugs were only mentioned in nursery rhymes. These nuisance pests were eliminated completed in the United States in the 1940s with chemical pesticides such as DDT, but they have reappeared. Today, signs of bed bug infestations had been reported in 28 U.S. states and in Great Britain. Every big city in the world has this pest problem. Homes, apartments, and even world-class hotels have reported them. Their reappearance is attributed to the increase in international travel and changes in the kinds of pesticides available to pest control professionals. 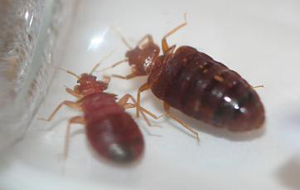 The bed bug thrives and is often carried around the world in suitcases and in airplanes. They are also transported in second-hand or rental furniture and may be accidentally moved with clothing, flea market items, international imports, and other personal items. Even if you are not an international traveler, you could still come in contact with these pests. Many of the hotel chains in the U.S., are fighting infestations. Bed bugs are not associated with poor housekeeping or being dirty. Experts agree the growth in bed bug populations will inevitably spread to theatres, restaurants, hospitals, public transit, and homes. There are 92 species of bed bugs, also known as the wall louse, house bug, mahogany flat, red coat, or crimson rambler. The most common is the mahogany brown variety that is very small and measures only 1/5 to 1/8 inch across. The bed bug has a small, flattened oval shape and short, non-functional forewings. While some bed bugs use hosts including birds, bats, owls, pigeons, pet roosters, and other poultry, we are most concerned with the bed bugs that attack humans. Carefully inspect imported wood furniture, antique beds, and areas with presence of roosting birds or bats. All may harbor these bed bugs. Bed bugs feed on blood. The female lays eggs and exudes a quick drying cement to hold the eggs to surfaces where they are deposited, typically in cracks and crevices and behind woodwork. The nymph is white but turns red or purple after its first blood meal, swelling to the size of a ladybug. The adult can survive long periods without feeding on a human host. They typically live from 7 to 18 months. Females are prolific and lay 200 or more eggs during their lifetime. You'll note their presence by bloodstains on walls, beds, sheets, curtains, behind folds of mattresses and daybed covers, and even in cracks and crevices of the headboard or bedposts. They can establish themselves behind baseboards, windows, door casings, wood picture frames, and furniture. They often stain surfaces with their black excrement as well as with blood. Egg shells or molted skins may be apparent and these pest leave a strong, sickly sweet odor. Their bite is painless and often victims may be unaware they have been bitten. The bugs are drawn to human breath and emerge at night so the bedroom is the logical place for them to strike. They may also bite during the day, particularly if the light is dim. While bed bugs are a nuisance to adults, attacks on infants have led to iron deficiencies. They typically bite the face, neck, arms, or hands. They can cause a mild allergic reaction and itching from their saliva, but in sensitive individuals, they may cause hive-like swelling and even asthmatic symptoms or cellulites, a painful skin infection. Today these pests are seen as potential vectors of Hepatitis B and other blood-transmitted, viral diseases. Your pest management professional will treat the building, room, furniture and cracks and crevices where bed bugs hide and establish an on-going eradication program. Clothing, sheets, and other bedding and curtains should be washed regularly in hot water and carpets steam cleaned and vacuumed frequently to eradicate these pests. With so much media coverage about bedbugs, I'm wondering if they really do transmit disease. What factors have contributed to their resurgence? I’m concerned because I'm a frequent business traveler and spend many nights in different hotels throughout the United States. The short answer is no, they are not linked to any disease transmission. According to research published in the journal, Public Health Significance of Urban Pests, by the World Health Organization, common bedbugs have been found to naturally contain 28 human pathogens, but they have never been proven to transmit human pathogens, either biologically or mechanically, and this includes Hepatitis C and HIV. It is important to note that humans with repeated bites often suffer allergic reactions. Typical symptoms include raised, inflamed, reddish wheal at each feeding site and can itch intensely for several days. Children or elderly, in particularly, who suffer many bedbug bites, could become anemic due to the blood loss. My first encounter with bedbugs was over 40 years ago working with a team of my University of Memphis college professors on a bedbug study/control program in rural Mississippi in what was then one of the poorest counties in the U.S. Bedbugs had spread throughout a housing area where tenants had no inside plumbing or electricity. We successfully treated the area during several study and treatment visits. Until a few of years ago, bedbugs were not a pest control issue. Bedbugs are nocturnal, feeding at night on small animals and humans. During the day they can be found hiding in the folds of mattresses, inside box springs, behind bed boards, in furniture, clothing, behind base boards and in wall voids. Bedbug control requires a thorough exhaustive search, treatment and follow-up. There are many explanations for the resurgence of bedbugs in the U.S. ranging from absurd to highly likely. The most common theories include increased travel to and from third world countries where conditions conducive to bedbugs are normal. With an ever increasing population density in metropolitan areas, often leading to sanitation issues, bed bugs and other pests are increasing. Many very effective products once used by pest professionals to control bedbugs have been removed from the market due to health and safety issues. Techniques, including routine base board applications of these products, have been replaced by crack and crevice and spot applications with products that do not possess the longer residual effects as their predecessors. This has played a role in the resurgence of bed bugs. The keys to bedbug control are a thorough and exhaustive search, treatment and follow-up inspections by well trained Enviroguard pest management professionals. Should I be worried about bed bugs when I travel? Yes. Ask your hotel or motel manager if they have on-going pest control service for every room and if they have had bed bug problems. Check the bedding in your hotel room for brown dried blood stains on the mattress and box springs and their binding as well as on areas where you might sit (chairs, sofas). They may hide under the edge of carpet or under loose wall coverity where they remain undisturbed The common bed bug is round to oval, wingless, and dark reddish brown. They are 3/8 to 5/8 inches long. The eggs are cemented to surfaces and hatch in 6-10 days and prefer a 55 to a 98 degree habitat. The bed bug can live up to 18 months in bed frames, headboards, “popcorn” ceilings, and furniture without feeding on a mammal or human host. They are nocturnal and you normally won’t see them. While there is no history of disease transmission between bed bugs and humans, people may react to their painless bites. Some people don’t react to the bite with swelling and itching and may be unaware they are being bitten. We are experiencing resurgence in bed bugs due to more travel to and from undeveloped areas, tropical areas, the opening of Eastern Europe, more military deployments, international students and tourism, and U.S. students engaged in exchange programs. They cross all socioeconomic levels. They are currently in the news because of regulatory changes and loss of effective product active ingredients including DDT. Also pest management companies are using less routine surface applications of pesticides and this means more bugs. New techniques are being developed and tested. Enviroguard Pest Solutions uses vacuuming, steaming, and an insecticide treatment in a comprehensive program to kill bed bugs. I would urge caution when purchasing flea market furniture or luggage or renting used furniture and bedding. In your hotel room, store your luggage on a rack, off the floor, if possible so you don’t bring bugs home with you. When traveling by car, I travel with single-use, disposable shopping bags instead of luggage. Check too for additional bed bug hosts like birds (particularly pigeons) and bats that may be nesting in the eaves. Also remember bedbugs are found in dorms, homes, cars or public transit seats. They attach themselves and are transported to a new site, even another country. I think my daughter was bitten by bed bugs on a recent overnight school trip. How can I be sure? You would need an actual specimen to be sure. Typically, these nocturnal pests bite between 2:00 a.m. to 6:00 a.m. She would not have seen the bugs when she woke up. Also, they have small piercing and sucking mouthparts, and often the victim feels nothing. The only sign will be red bumps on the skin and these usually follow a vein. The bites may itch and be uncomfortable. While these pests are difficult to detect, the diseases they carry are not transmitted to humans. When you stay in a hotel in the future, don't put your suitcase on the floor until you inspect the mattress for signs of dried blood and dark stains. Pull back sheets and covers and check the piping or cording on the mattress and box springs. Bedbugs like to hide during they day and have been found in bed frames, headboards, and in the folds of pleated drapes. The bed bugs could easily be transferred on luggage to your home.